I recently found the awesomeness that is Sweet Sugar Belle's blog. I was so inspired by her creations that I went ahead and made my first batch of sugar cookies. Ever. It took me a while to make these and my hands were tired by the time I was done icing 30 cookies. Not too shabby for my first batch. My kids were gone while I decorated these but I did save one for each to decorate! My kids and husband have gobbled these up, I've only had one. Honestly I prefer my sugar cookies plain. The icing on these puppies (royal icing) is sugar overload for me. These were so fun to make and I think I'll be making them again. I learned a few tips and tricks that made these easy to make. Like rolling out your dough between wax paper and then popping in the fridge before cutting. Putting your flood icing in a restaurant squeeze bottle. Putting your icing in saran wrap for easy clean up. There are lots of helpful videos at University of a Cookie. In fact here is a video featuring Sugar Belle making the snowflake cookies. 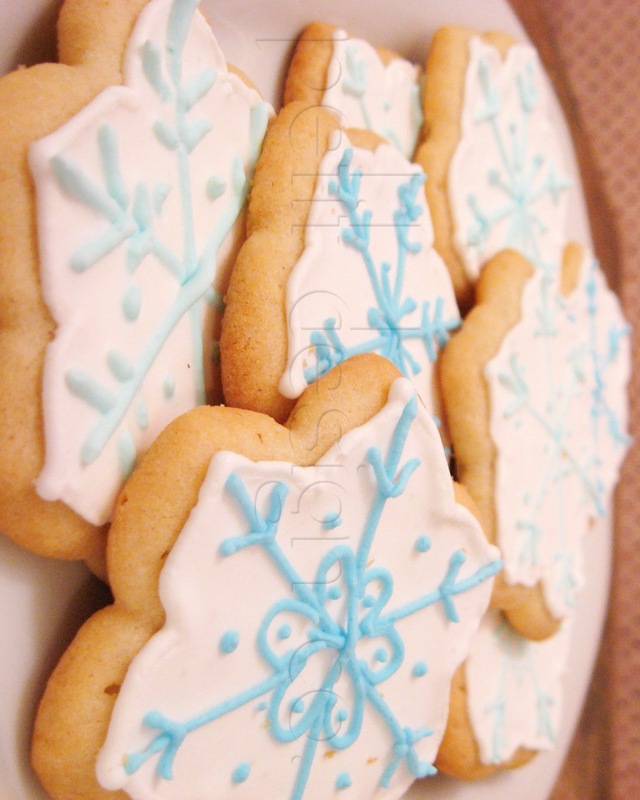 Do you like to make sugar cookies this time of year? Do you let your kids help or are you a cookie Nazi? Your cookies are beautiful. Thanks for the tips. I go for the easy road. Plain ones sound good. At this point in my life, the time consumed decorating cookies and the end net result don't seem worth it. As a hobby, it sounds fun. Just to make--not so much. I guess you could call me an appreciator, rather than a creator. Again, they are lovely--you did excellent work. Oh my! I want some of these. I think cookie making will have to go on our list of things to do next week. Yum. I checked out her site. Now I'm hungry. Phil would be so proud of your "anatomically correct" snowflakes. Snowflakes with anything other than 6 points was one of his pet peeves. They are gorgeous (and tasty, I'm sure).